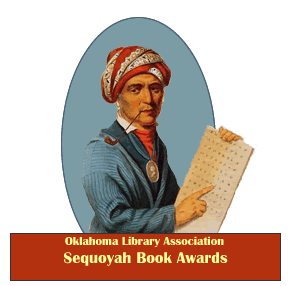 Sponsored by the Oklahoma Library Association, the annual Sequoyah Awards are named in honor of the Native American leader who created the Cherokee syllabary, making it possible to read and write in Cherokee for the first time! You can read and learn more about Sequoyah and his great achievements. These awards honor Sequoyah’s advances for literacy by recognizing outstanding books for young people. There are three categories: children’s, for grades 3 – 5; intermediate, for grades 6-8; and high school, for grades 9 – 12. Each list contains a variety of titles that feature a range of genres, reading levels, and interests. Read 3 books from your category and vote for your favorite. The book with the most votes in each category wins! Read three or more books from your category and cast your ballot! Click here to vote. Voting ends March 15. Thanks to the Oklahoma Library Association for administering this great program!